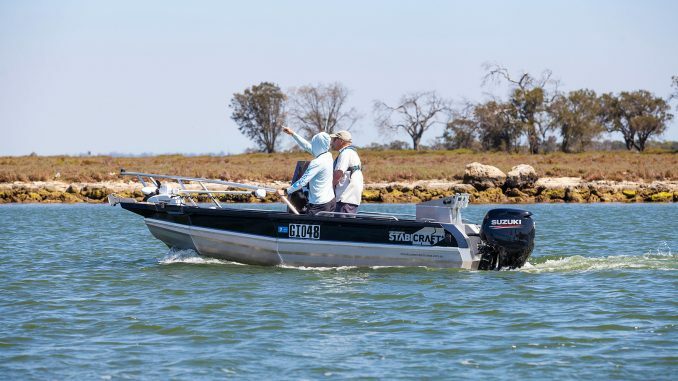 Ross Tizard’s Stabicraft 1550 is set up ideally for his Mandurah lifestyle, which includes bream fishing, crabbing and sneaking offshore for snapper. 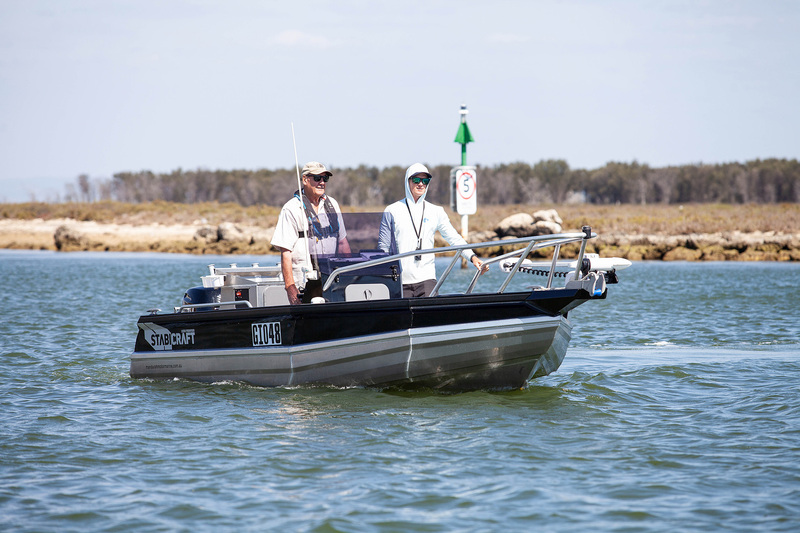 It’s not that often that we get to head out with a dealer’s customer to do a boat test, but Scott De Mouncey of Mandurah Motor Marine was 100% confident that his repeat customer, Ross Tizard, was the perfect advocate for his New Zealand built Stabicraft boat range. Ross is now on his second Stabicraft, with the 1550 being an upgrade from a smaller Stabi that he owned previously. 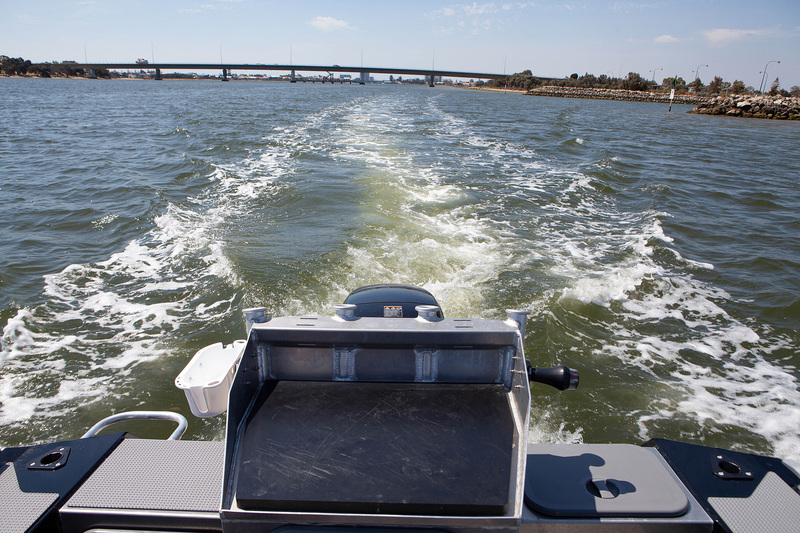 He was happy to take us out on the Mandurah estuary on a windy afternoon to show us just what it could do. Ross is retired, and he’s pretty particular about what he needs his boat to do. 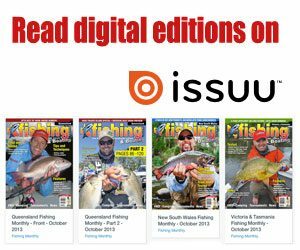 Whether it is crabbing, chasing black bream up the Murray River or sneaking offshore to chase a few snapper, Ross’ boat needs to be able to handle all of these activities and be able to do it by himself. 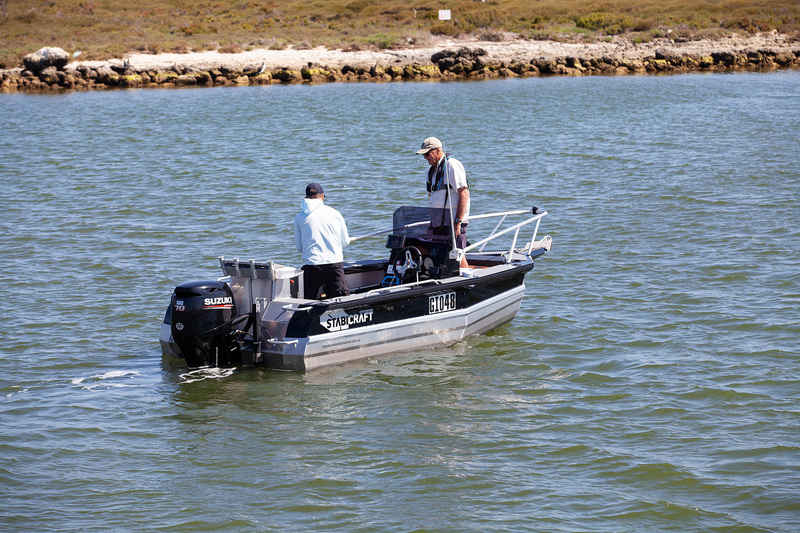 That includes single-handed launch and retrieve and boat positioning on the water. Let’s have a look at how he’s done it. 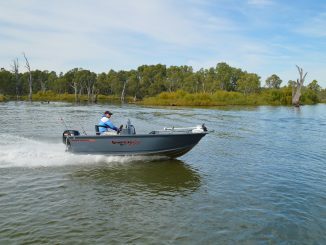 The 1550 hull is fitted with a 70HP Suzuki 4-stroke outboard which gives Ross wonderful economy – up to 4.25km/L at 3700rpm and 35km/h – giving a theoretical range of over 300km in ideal conditions. In Ross’ case, this means that it’s often a long time between service station visits to fuel up. Stabicraft hulls are unique in the way that they incorporate welded aluminium airtight tubes into the hull design. These increase the stability and buoyancy of the rig, with the compromise being reduced internal beam. There are a few things that Ross has done to counter the reduction of room, including the addition of a fold-away helm seat for the driver and high internal gunwales in the cockpit. The console is broad and provides protection from a little wind spray. It easily holds all of the gauges and switches Ross needs for his daily boat operation. 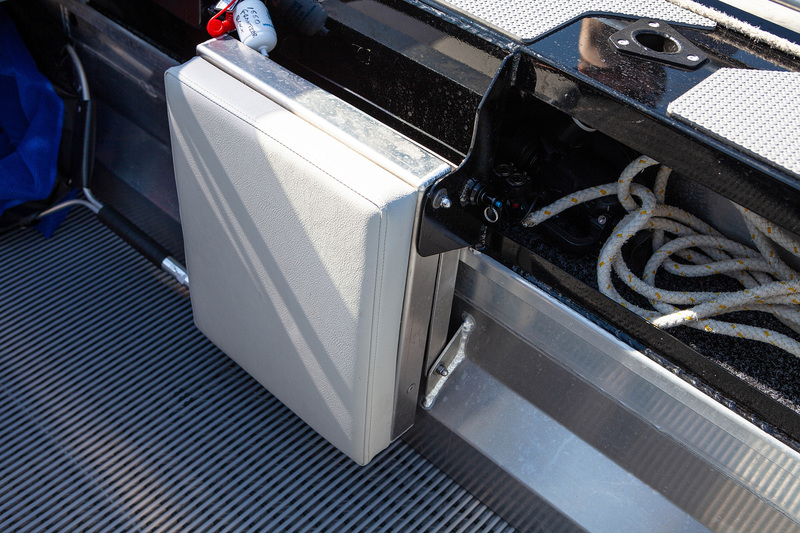 The Stabicraft’s excellent stability comes from welded external tubes that add flotation to each gunwale. 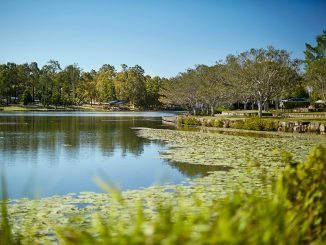 There’s a lot of Mandurah’s waterways that are speed limited. The 1550 is quiet and stable at non-planing speeds. We loved the fold-down seat. It’s held up by two removable pins, and it stows away to give the extra room in the cockpit that Ross needs. Another day in the office for Ross. Retirement at Mandurah is awesome. Happy fishing, Mr Tizard! 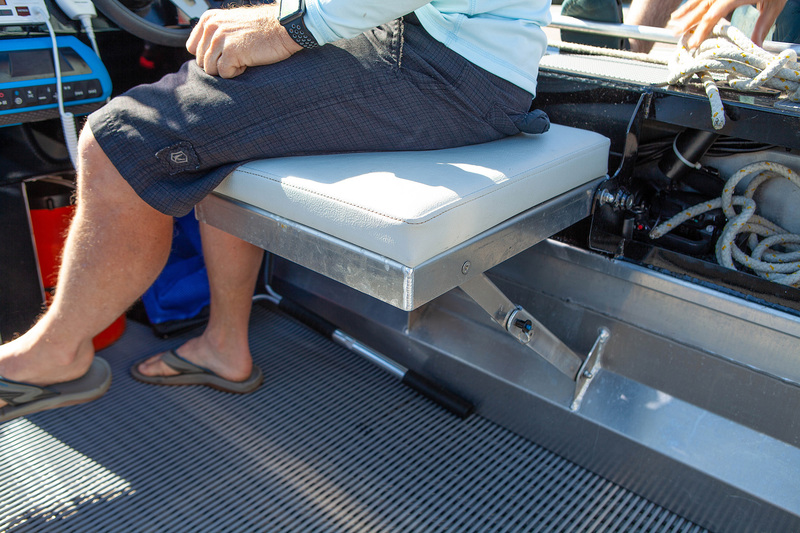 The cockpit has plenty of depth to remain fishable in rougher conditions and suits Ross’ style of fishing perfectly. 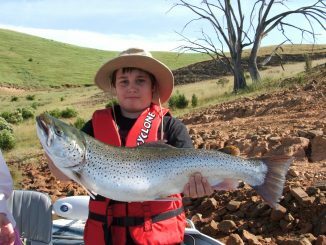 Boat builders often try to keep the batteries and the centre of gravity of their boats as low as possible. Sometimes this makes the batteries harder to access. The Stabicraft’s stability isn’t compromised by this setup and batteries are very easily checked. 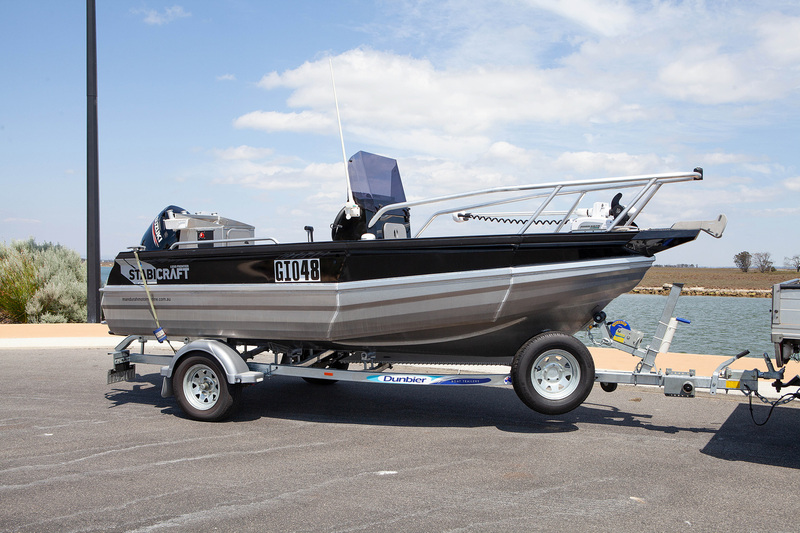 It’s rare to see a transom build like this in an Aussie boat; there are cranking and trolling motor batteries in the hatch and a bait station on the top. 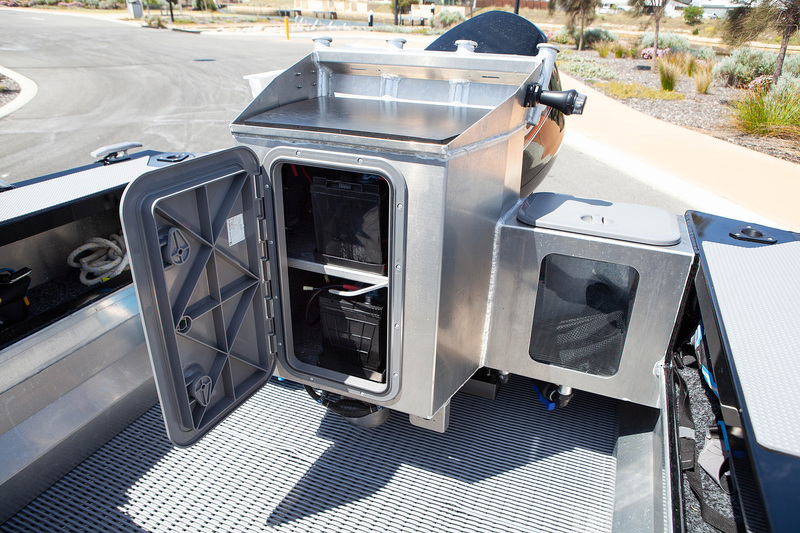 The windowed live bait tank on the port side is particularly useful. 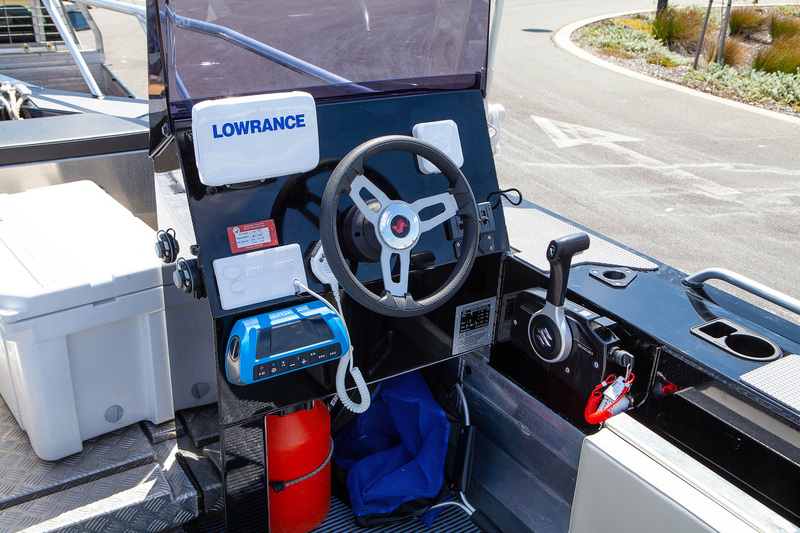 A broad console holds Ross’ fishfinder, engine gauges, radio, music and accessory switches. Fifteen degrees of transom deadrise helps the hull negotiate the often choppy waters of Peel Inlet and the Indian Ocean. 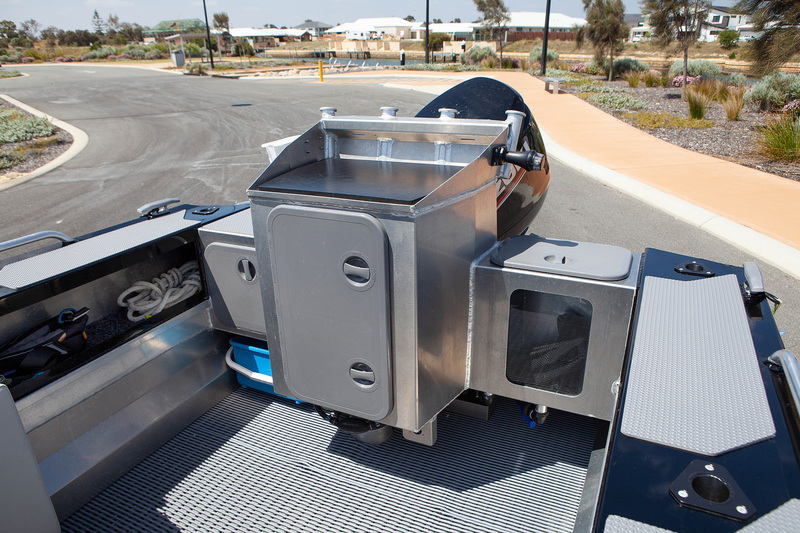 Supplied on a single axle Dunbier trailer, the whole rig is easily manoeuvrable in a garage and capable of being launched one-handed. Also unique to the Stabicraft as a long sub-gunwale shelf that can easily accommodate a couple of fishing rods and all of Ross’ accessories that he needs ready-to-hand. 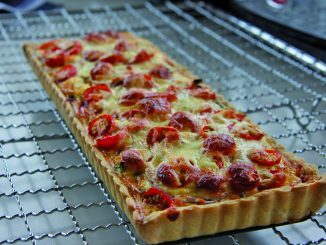 “The wide gunwales also provide an excellent place to sit,” Ross added. 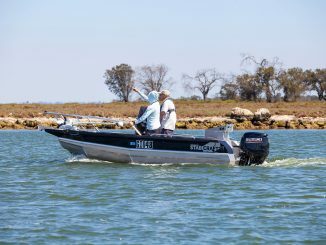 On the port side of the transom, a large, windowed live bait tank allows you to keep an eye on your catch or livies and ensure that they’re in prime condition. 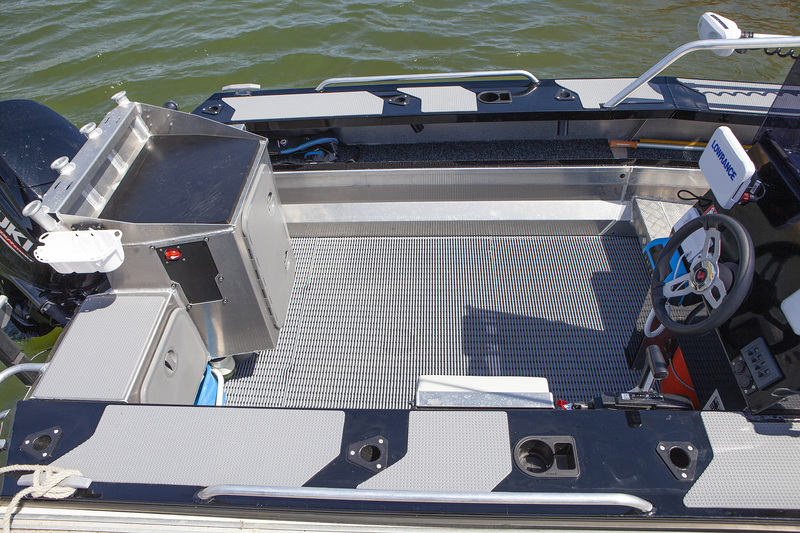 The raised front deck gives you a place to cast lures from while under Minn Kota power, however Ross’ Stabicraft also comes with raised rails so you can get up there when it’s a little rough. Ross admits that he’s not the world’s smallest man, and appreciates the extra support up front. Important to Ross is that the rig is easily launchable and manoeuvrable single-handed, as he often ventures out on his own to hunt and gather. The single-axled Dunbier trailer facilitates this, and he has a system worked out with a couple of ropes that makes it all look too easy. 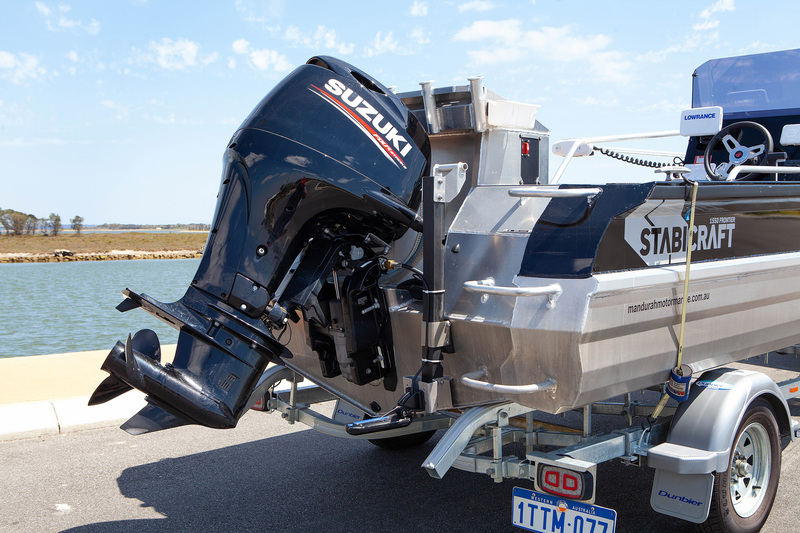 Both of Ross’ Stabicraft boats have been supplied and delivered by Mandurah Motor Marine in Mandurah, WA. 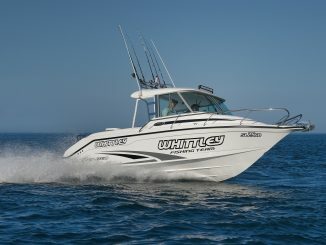 You can find out more on their website at www.mandurahmotormarine.com.au. As tested, Ross’ package came in at $52,500 with all electronics. Base packages start from $45,000.